Both students and business partners agree; the construction pilot program at Canyon High is a big success. In fact, it will be offered at all three traditional high schools in the district beginning the fall of 2019. CHS, Canyon Lake High School and Smithson Valley High School have included the Architect/Construction graduation pathway to their course selections. This success is a direct result of the district’s partnership with the Greater New Braunfels Home Builders Association (GNBHBA), says CHS Construction Teacher Matt Owen. Association members have provided internships to train and mentor students interested in careers in construction as well invest in their education about construction careers with classroom presentations. Currently, 12 CHS students are working 20 to 25 hours a week and gaining real-world experience with local contractors who are teaching their crafts including plumbing, electrical, HVAC, roofing, concrete and general construction. These paid internships are making life-changing impacts on these Cougars. 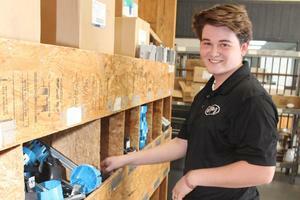 CHS Senior Jayce Robbins is interning with JPI Electric in Schertz. Right now, he prepares boxes for the field, making sure that the electrician or technician has all the materials needed for a job. Because of what he has learned, Robbins plans to continue to work for the locally-owned company upon graduation and stay in the electrical field. “This internship has opened my eyes to what I could do in the future,” says Robbins, who was unsure of what his next step may be prior to taking the construction pathway course this year. 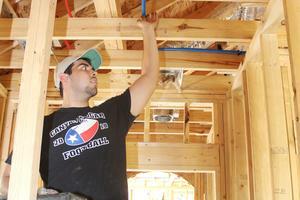 For CHS Senior Adam Alcorta, an internship with Quality Plumbing in New Braunfels has given him the foundation needed to understand how important every aspect of construction is to the end product. Alcorta will attend West Texas A&M University in the fall with plans to study civil engineering. He also plans to continue to work for Quality Plumbing in the summer and whenever he is home for holidays. “This has been a great opportunity for me to see all that goes into construction,” Alcorta says. “It takes a lot of hard work and long hours. You leave when the job is done, and you have to pay attention to a lot of small details. As a small business owner, Nick Hamilton, owner of JPI Electric, wanted to not only help a student learn a trade, but also be a mentor like his father, who was a mechanic, did for him. Besides Quality Plumbing and JPI Electric, other local business partners providing internships this year are Connally Plumbing, Ott Plumbing, Earnest Roofing, Zellner Electric, Lowry Electric, Dibello Architects, TIG Plumbing, Christianson Air Conditioning and Plumbing, In Charge Electric, New Braunfels Home Depot and Miranda Plumbing. In addition, several construction businesses gave classroom presentations this year including T.A. French Custom Builder, G. Morris Custom Homes and Infinity Concrete Construction. Owen explained how this pilot program would not have been possible without the help of GNBHBA members such as Kris Kagey, a former CISD teacher and administrator who is now general manager of Moore Supply, and David Hevner with Quality Plumbing. The 12 CHS students with current internships include Alcorta, Robbins, Ty Aird, Peyton DeGroote, Tristin Smith, Bryson Kizer, Jake Vest, Cameron Shaw, Andres Lujan, Dylan Dietz, William Killingsworth and Ty Pizarro. -As part of a construction pilot program, Canyon High Senior Jayce Robbins has been interning with JPI Electric in Schertz since October. He hopes to continue to work for the company when he graduates. 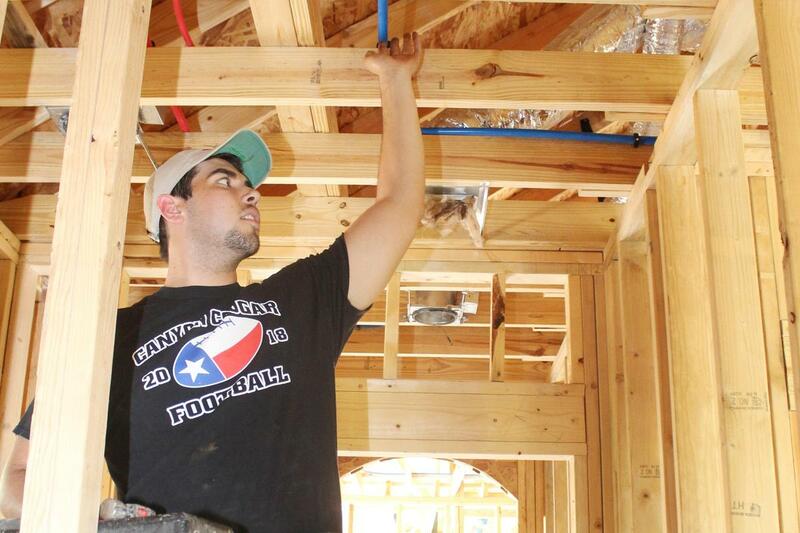 - As part of a construction pilot program, Canyon High Senior Adam Alcorta has been interning with Quality Plumbing in New Braunfels on new home construction. He plans to attend college when he graduates but continue to work for Quality in the summer and on holidays.